and lived before moving to Guildford. 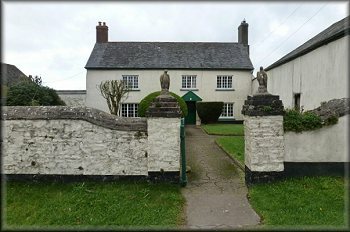 John and Raymond Dennis were brought up in Huntshaw in Devon. John then moved to Guildford where, whilst working for an ironmonger Filmer & Masons, he started making bicycles in his spare time. These sold at a profit and in 1895 he set up his own business, the Universal Athletic Stores in Guildford High Street, selling bicycles and other sports goods. Here he was joined by his brother Raymond and the enterprise expanded. Bicycle manufacturing continued and other products were made were tricycles and quadricycles. The first motorised vehicle built in 1898, was a tricycle fitted with a single cylinder De Dion engine. This was followed by other motorised vehicles with the first proper car being built in 1901. At about this time, the business became a private limited company, Dennis Brothers Limited. Technical development was a key aspect of the enterprise and an early innovation was the worm drive rear axle which was used from 1903. 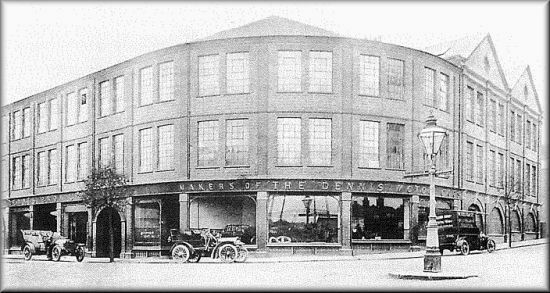 1901 Dennis moved into the new, purpose built Rodboro Buildings and even this building was extended two years later to cope with the demand. 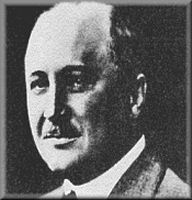 The first car was produced using the De Dion engine. Customers included Brazilian Viscount and Russian Dukes!! The brothers were successful with their cars, competing in various speed and endurance trials but realised that the market was limited. 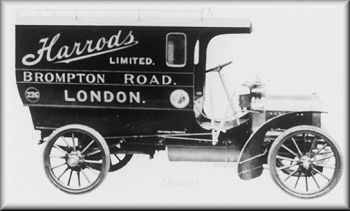 Cars at that time were mostly bought by the gentry so they took the decision to move into commercial vehicles, the first being made in 1904 - a 15 cwt van for Harrods of London. This was soon followed by the first bus chassis, fitted with a 28 hp Aster engine, which went to Benjamin Richardson. Like other vehicles at this time, the engine and transmission were mounted on a sub-frame to reduce stresses. The worm drive axle was patented in 1904. 1904 15 cwt van for Harrods of London. Production expanded and in 1908 Dennis made their first fire engine. By 1909, over 400 staff were employed in the works. Commercial vehicle production volume had overtaken that of cars in 1905 and in 1913 it was decided to discontinue making cars and concentrate on commercial vehicles. A range of goods chassis were made ranging from 15 cwt to 5 ton capacity and these were fitted with either lorry or van bodywork for haulage work or bodied as single or double deck buses. 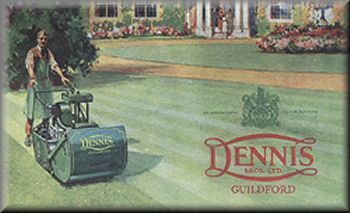 The Government subsidy scheme had already begun by 1913 and Dennis submitted the 3 ton lorry for approval. 7000 were built and other war work comprised pumping sets, and a small number of lorries and buses for civilian use and export. Big changes following the war saw Dennis export business growing and expanding into the field of municipal vehicles such as road sweepers and vacuum gully emptiers. Lawn mower production started in 1922. Bus and lorry chassis were updated and a typical double decker was offered on a 4- ton chassis with seats for up to 48, 24 on each deck. Many were sold for use in London. During the time of economic depression, the diversity of products kept the firm going and in 1925 they launched their first purpose-built low framed forward control bus chassis. This was the E type and featured a monoblock engine, unit mounted gearbox, underslung worm axle and pneumatic tyres. The separate engine sub frame used in earlier models was discontinued at this stage. Pneumatic tyres were introduced on single deckers in 1925 and were permitted on double deckers in 1928, many older chassis being so converted. Lorry production was not buoyant during the years of the 30's depression, but the firm kept going with its export business, fire engines, municipal vehicles and passenger chassis. All bus production stopped and the Guildford works set about war production, building 700 Churchill tanks, 4500 army lorries, and 3000 tracked personnel carriers. At this time there were 3000 works staff. A few civilian lorries were produced for the home market and these were fitted with utility design of cabs. Whilst the prospects for passenger vehicles and fire engines was good after the war, the same could not be said for the goods vehicle side. One of the new developments was the O6 diesel engine which gave 100bhp and was offered in both double and single deck chassis, the revived and updated Lance and Lancet. Both were available with the 5-speed overdrive gearbox, giving the buses and coaches a good turn of speed, and the Lancet in particular sold well in a market hungry for social travel. Dennis had been slow in developing its own diesel engine in the 1930s and although the front engined single deck chassis sold well in the 50s, the development of a satisfactory underfloor engined bus chassis also lagged behind that of other manufacturers. One was developed but sales were limited. From 1957, Dennis offered a low height double deck chassis, this being the Bristol Lodekka design built under licence. The licence agreement included a 2-way exchange of technical information. Dennis developed the epicyclic gearbox for this model and thus semi-automatic Bristol Lodekkas effectively have Dennis transmission. Bus manufacture ceased in 1967. In the early 1970s, the business once again concentrated on exports. The company was bought by the Hestair group and was re-named Hestair-Dennis. A rationalisation of models on offer led to a recovery with significant earnings from the export business. By the mid-70s, Dennis were ready once again to offer both goods vehicles and buses on the domestic market. The bus industry was seeking an alternative rear engined double decker and the Dominator was developed, utilising a Gardner engine and Voith retarder transmission. This was sold both at home and overseas, being supplemented in the export market by a front engined version, the Jubilant. Eventually larger overseas chassis were also produced, the Condor and Dragon being 6-wheel chassis derived from the Dominator design and capable of carrying 172 seat bodywork. In 1989, the Hestair vehicle interests were sold to Trinity Holdings, a new company set up by directors from the vehicle groups. By this time, Dennis (now known as Dennis Specialist Vehicles) were offering a range of bus and coach chassis comprising the Dominator, Jubilant, Condor, Dragon, Falcon, Lancet and Dorchester as well as fire engines. 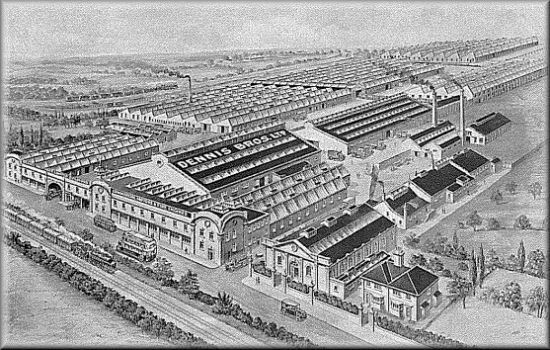 Municipal vehicle production had by then been moved to the 'Eagle' site in Warwick and cab production was relocated to Blackpool. 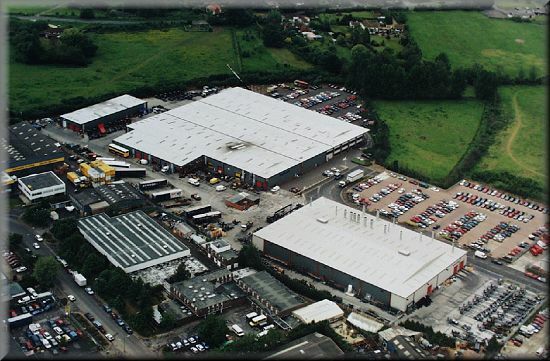 In 1991 the Guildford factory was focussing on psv and fire engine chassis and production was moved from Woodbridge Road to a new facility on an industrial estate at Slyfield. The fact that Dennis are still manufacturing vehicles and have been doing so for over 100 years is an industrial success story by any standards. Much has been written over the years about this success. Not all has been plain sailing, of course, and the hallmark of many a business is to explore openings as they arise, to build on the successes and drop the less successful. The business always benefited from technical innovation and Dennis were pioneers of many engineering developments. To this was added the policy of product diversification and this carried the business through a range of periods of boom and depression. By diversifying into a number of specialist markets and by being ready to promote exports, the business has survived and prospered. In 1998 Trinity Holdings was then bought out by the Mayflower Corporation and in 2001TransBus International was created employing 2,000 employees within the Group. In 2004 TransBus International went into Administration and Alexander Dennis Limited (ADL) was established. 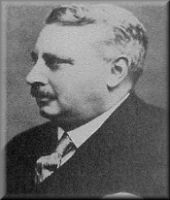 A consortium of business entrepeneurs, led by Noble Grossart, Merchant Bankers; the Bank of Scotland; Brian Souter from Stagecoach and his sister Ann Gloag, together with the Chairman of Glasgow Rangers, David Murray, acquired the major part of the business previously held by TransBus International. The acquisition of Plaxton Holdings Limited in 2007 by ADL created Britains largest bus and coach manufacturing operation, providing a platform for entry into new European and global markets.